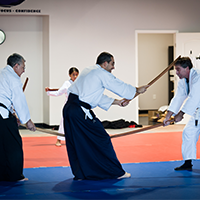 An individual membership at the Texas Rock Gym gives you access to free Aikido Lessons. 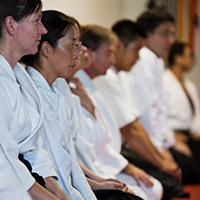 If you do not want to purchase the membership option you can join the Aikido class for a $10 drop in fee per lesson. Visit our page with class times to see if this option fits into your schedule. With 4 hours of training on Saturdays and Sundays, you’re sure to fulfill your workout needs for the week. 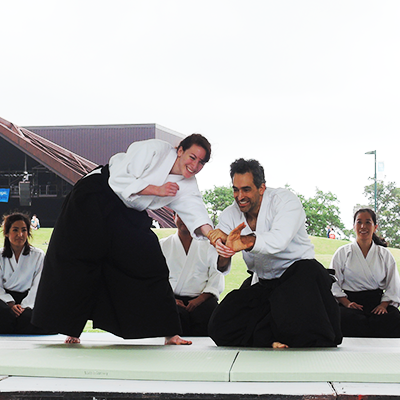 Visit the Arlington Aikido website for more information on the fee structure and class schedules. Is Aikido really effective for self defense? Aikido and all other martial arts are effective if one trains and uses them properly. 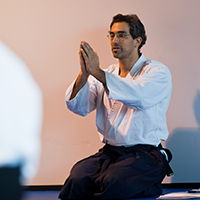 How do I know Aikido is for me? I believe Aikido can benefit almost any one, in my opinion one must train for a minimum of 3 to 6 months to find an answer for herself / himself. Is there any minimum or maximum age requirements to learn or train in Aikido? There are no age restrictions, but an interest and ability to learn mentally and physically with training on a regular basis. I have a minimum age of 6yrs old for children, however may consider a younger child after consulting with his /her parents. Is Aikido only for men? No, definitely not. 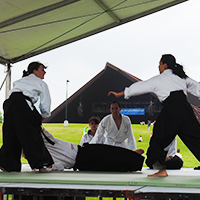 Women can actually progress better, because an Aikido practitioner learns to use body movements not physical strength to defend herself / himself against one or more attackers. I have a black belt in another martial art or arts, can I get my black belt in Aikido in less than your required minimum time? No. Minimum time is 2.5 to 3 years based on average of 10 to 12 training days per month for every one. All Classes are normally taught by the head instructor, Erik Sasha Calderon. Sometimes, if he is sick or out of town, his top students will teach.